The Majestic is the Industries largest,strongest most innovative drop in step for above ground swimming pools. 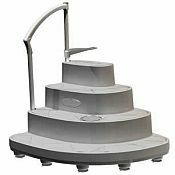 It features a removable counterweight system that keeps the step from floating. The steps mounting pads lift the bottom of the step away from the liner to allow true, complete water flow. This unique design helps to avoid potential algae formation. 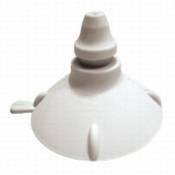 Also the step cups will protect the liner while keeping the step in position at the bottom of your pool by using suction. The Majestic step measures 58" wide x 44" deep x 43.5" tall and will accommodate up to 500 lbs. Removable ballast allows for easy winter put away. Patented cups protect your liner and reduce algae buildup. Fits any pool from 48"-54" deep. Will accommodate up to 500 lbs.